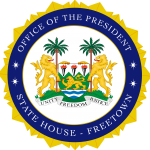 State House, Freetown, Tuesday 13 November 2018 – Sierra Leone’s Ambassador to the Kingdom of Saudi Arabia, Dr Ibrahim Jalloh, has called at State House to bid farewell to His Excellency President Julius Maada Bio, following his recent appointment. Ambassador Jalloh thanked the President for giving him the honour to serve under his leadership. He said he was pleased to go back to a country he considered a familiar ground. He disclosed that Saudi Arabia was a very important country in the Arab world with a lot of opportunities he hoped to explore in the best interest of Sierra Leone. He added that this year’s Pilgrimage was a huge success for the country, noting that he was determined to build on that success and to further increase the opportunities for Sierra Leoneans wishing to perform the Holy Pilgrimage in Mecca in years to come. He said Saudi was also interested in education and that with education being the flagship project of the Bio government, he would do his best to bring support to the county. He assured of his commitment to further strengthen the relationship between the two countries. In his brief remarks, President Bio congratulated Ambassador Jalloh on his new role. He said that Riyadh, the capital of Saudi Arabia, was an important destination with tremendous potentials for bilateral and multilateral relationships for Sierra Leone. He added: “Fortunately for us, you have been there before and understand the system well. So, you deserved to be appointed to represent us there. We look forward to you leveraging your connections and knowledge of the area and to strengthen and widen our relationship with Saudi Arabia,” he ended.